On October 5, Lundaspexarna is going on tour to Linköping to make two unique performances of this spring’s spex-production “Bonifacius” (October 6). As I was flicking through archive material for a current drawing assignment, I came upon this Rune A. sketch of “Bonifatius”, which I found kind of funny. 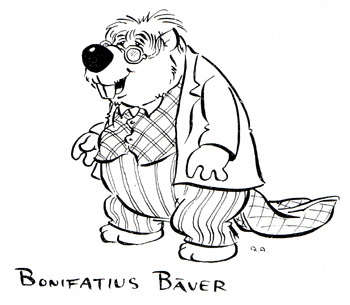 The spex-character Bonifacius is a pope, while the Rune A. character Bonifatius is a beaver. Is there anyone out there who knows in what Bamse-issue Bonifatius appears? What are his personality traits? This entry was posted in Bamse, Comics, Spex by Andreas Qassim. Bookmark the permalink. If any readers would wonder what a “spex” is, there’s some info on Wikipedia: http://en.wikipedia.org/wiki/Spex_%28theatre%29 Also, we have probably figured out who the character is, now, a “selectively deaf” old fogey, who is part of a scheme on trickïng the evil capitalist “Croesus Vole” into giving a million Swedish Kronor to a kindergarten. He’s a generally nice guy. Thanks, Håkan for sorting this matter out! Croesus Vole = funny. Translated dialogue: CV: Then, I’d happily give you a million! BB: A melon? That’s yucky! CV: A MILLION! BB: A million melons!? That’s even yuckier!